COLORADO SPRINGS, Colo. – Adams State senior sprinter KayMarie Jones (St. Elizabeth, Jamaica) put up a pair of NCAA Championships provisional qualifying marks at the Univ. of New Mexico Cherry & Silver Invitational last weekend, and for her efforts has been tabbed as the Rocky Mountain Athletic Conference (RMAC) Women’s Track Athlete of Week, league officials announced Wednesday. An all-American indoors last season in both the 60 meter hurdles and as a member of the Grizzlies distance medley relay squad, Jones hit provisional standards on Saturday in 400 meter dash as well as 60 meter hurdles. In the 400, Jones recorded one of ASC’s top finishes of the day, placing second with a time of 55.26 seconds (55.67 adjusted), which stands as the No. 2 time in Division II early in the season. In the hurdles, Jones had the second fastest time in the preliminary round of 8.50 seconds (8.52 adjusted), before going on to place fifth in the final. Her time in the hurdles ranks sixth in DII so far this season. The Grizzlies swept the RMAC track honors this week, as freshman Boris Berian (Colorado Springs, Colo.) took honors as the men’s track athlete of the week for his performance in Albuquerque. As a team, the Adams State women laid claim to seven total provisional marks in two days at the Cherry & Silver Invitational. Senior Indira Spence (Trelawny, Jamaica), who won the 60 meter hurdles last season indoors and placed second in the 60 meter dash, earned a qualifier with a mark of 24.88 seconds (25.25 adjusted) in the 200 meter dash. Senior Cassie Mitchell (Tustin, Calif.) and sophomore Kelly Lamb (Creede, Colo.) each obtained provisional in the mile run. Mitchell, an all-American in the event last season ran to a first-place finish in five minutes, 1.76 seconds (4:55.79 adjusted), while Lamb clocked a 5:07.09 (5:00.00 adjusted). Mitchell currently ranks fourth at the distance in DII this season, while Lamb’s time is sixth on the performance list. Sophomore Zenobia Sims (Sierra Vista, Ariz.) and freshman Kris-Ann Walters (Kingston, Jamaica) owned qualifying marks in the 60 meter dash and triple jump, respectively, heading into the weekend’s action, and each managed to repeat the feat. Walters improved upon her previus mark in the triple jump, recording a distance of 11.68 meters (38 feet, 4 inches), and improved to the No. 11 mark in DII of the season. For Sims, however, her time did not better her mark of 7.67 seconds from December. After upping their total number of provisional marks to eight this season, the Adams State women held on to their No. 3 spot in the first set of regular season rankings released by the U.S. Track & Field and Cross Country Coaches’ Association on Tuesday, gaining 1.35 points for a total of 158.57. In the computer-based rankings that take into account both current and previous season data, Grand Valley State remains atop the women’s field by a large margin with 291.45 points, while Lincoln (Mo.) is a distant second with 194.60. Both of those squads saw their point total decrease from the preseason rankings. The rest of the top 10 reamains largely unchanged, as Ashland (Ohio) and Central Missouri hold tight at Nos. 4 and 5 with 129.45 and 109.17 points, respectively. The only change in the top 10 sees the RMAC’s Western State move up on spot to seventh with 101.41 points, displacing Grand Canyon (Ariz.) one spot to eighth. New Mexico Highlands, which comes in at 15th after rising seven spots from last week, and UC-Colorado Springs at 24th round out the league representation in the poll. The Cougars moved up one spot after from the preseason poll. Adams State returns to Albuquerque each of the next two weekends, where the Grizzlies will compete at the Jan. 27-28 Univ. 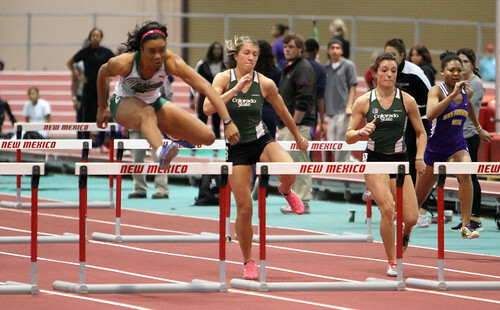 of New Mexico Invitational and the Feb. 3-4 Univ. of New Mexico Classic.